As you may know, we recently welcomed Miss Olivia Sage into the world last October. Becoming a parent comes with a lot of joy and excitement but it comes with a lot of unknowns as well. When it comes to all the baby gear, clothing and toys, it’s easy to become overwhelmed with questions. Where do I put all the gear? How do I set up the nursery? Will my house become a dumping ground for all things kiddo? Where will all their memorabilia and art creations go? I had all these same questions (and fears) before having a baby. I hope you’ll find the suggestions below helpful when it comes to creating space for your little one. It’s hard to know what you child will like until they try it! This goes for everything! One baby may love a certain swaddle while another can’t stand it. Before buying everything you think you will need I can’t stress how invaluable it is to try things out first! 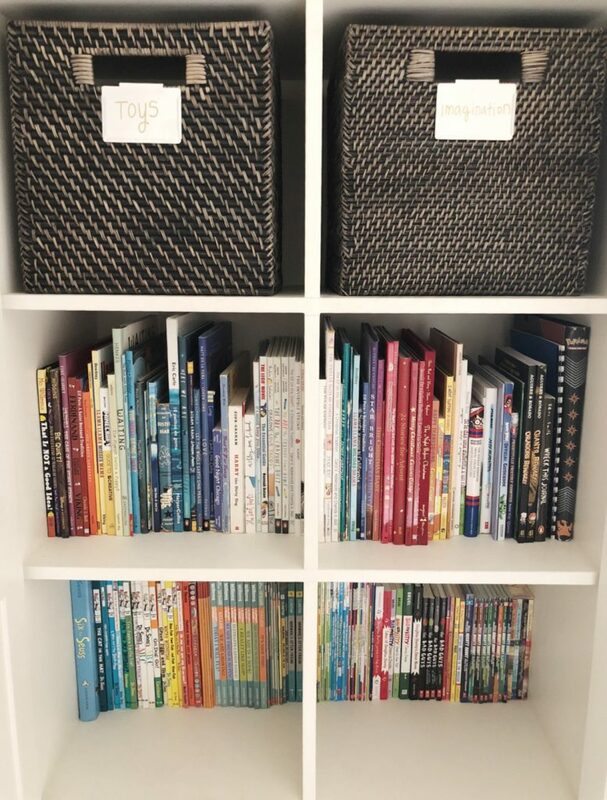 If you have an opportunity to borrow from friends or buy things second hand this a a great way to see if your child is into things, especially toys, before investing in things you may only need for a few months. Far too often we wait until the stuff has turned into a mountain before we realize that kids and their things need designated homes. I know they don’t take up a lot of space initially but things such as a stroller, car seat, changing table and all the gifts you will be given will need a place to live. Create designated homes and stick to it to avoid having your gear every where. Don’t be afraid to turn your dining room into playroom. It doesn’t have to be forever. Allow your home to work for your current needs and be flexible with your space. Once you designate your spaces, it will make things feel more contained and manageable. Most parents are overwhelmed with the amount of stuff that accumulates over time. Presents and birthday party goodie bags can be a challenge to set limits with. Create a system such as the “one in, one out” rule. Every time a new item comes in, one item goes out to a donation center. Or allow your child to keep one thing from the birthday party goodie bag and donate the rest. You are allowed to set limits with the amount of clutter that accumulates in your home in a loving way. Setting these boundaries at a young age, sets your child up for a healthy relationship to their belongings. Your home is a living, breathing thing that desires energy, attention and nourishment to stay clean and clear. Set aside time every day to pick up and put things back in their “homes.” The five minutes that you use to pick up will help put your mind at ease. This type of routine also shows your child the importance of respecting your space and your things. Do you have any tips that have saved you as a new parent? I’d love to hear from you in the comments below!